Avocado in the evening, avocado in the morning, avocado all day long! Avocados are one of our all-time favorite fruits. They’re delicious, incredibly versatile, super nutritious, packed with fiber, and have such a lovely green color that it’s no surprise they’ve become one of the hottest food trends in recent years. Take one spin around Pinterest searching “avocado,” and you’ll find a plethora of recipes, including avocado smoothies, avocado toast, and even avocado ice cream! One of our favorite ways to use this healthful fruit is to pair it with the cured flavors of smoked salmon. And just as the avocado itself is versatile, so is this recipe for Smoked Salmon and Avocado Tartines. Need a summery appetizer? These can be an easy bruschetta-style app. Hankering for avocado at lunchtime? Cut down the proportions of the recipe and make yourself a seasonal open-faced sandwich. Time for a snack? These healthy tartines will keep you full until dinnertime arrives. So grab an avocado and let’s get cooking! Slice bread to desired thickness. Place slices on baking sheet, brush with olive oil, and broil for 2 to 3 minutes, or until toasted. Let cool. Use an avocado scoop + masher to scoop the avocado meat from the skins and mash it; stir in the lemon juice. Season the mash with sea salt and pepper and mix well. Toast bread slices. 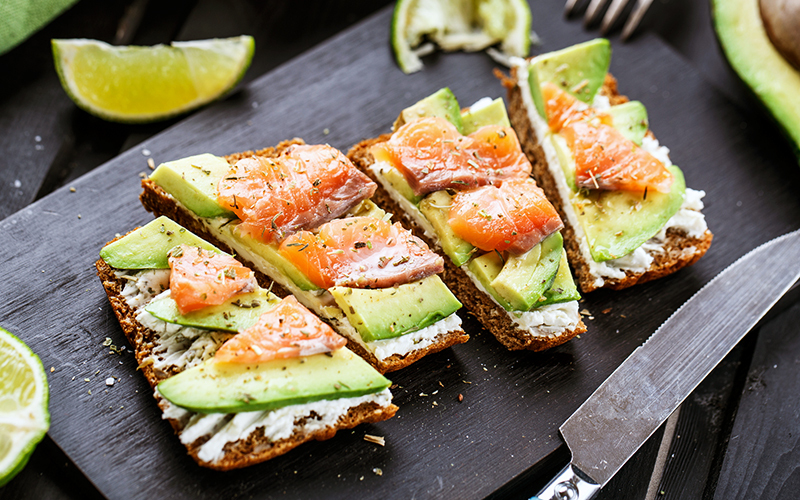 Spread the avocado mixture onto the toasted bread slices; artfully fold the smoked salmon slices and lay them atop the avocado mash on the toast (you may need to cut the salmon into smaller slices, depending on the number of toast slices you have). If using, sprinkle the red onion slices and/or capers over the salmon. Enjoy these tartines with friends, with family, or just on your own—don’t worry, we don’t tell! The photo doesn’t match the recipe’s description. In the photo it looks like there’s cream cheese (or some other white substance) spread on the bread, and the avocado is sliced. But in the recipe, the avocado is mashed with lemon juice and spread on the bread. The photo also doesn’t show the red onion or capers that are in the recipe.